Set in a fantastic location between green mountains and the gently shelving sands of the Acharavi beach, with its choice of watersports, this well run hotel also boasts a good range of facilities including a pool bar and taverna. I went to this hotel with my mum for a week and we would never go back there again. The service was great if you were German but extremely poor if you were British. We found that if you weren't out early to claim a sunbed (before 8 am) you didn't stand a chance - the Germans would beat you to it. The food was terrible - after going and trying the food each night and finding it awful and not fit for a dog - we ended up eating out most of the time. There's a lovely restaurant just up from beis beach - the Navigator - the staff were very friendly and the food was superb - we ate there a lot and would highly recommend it. The bar service was slow - staff too busy seeing to Germans. Snacks means a cheese and ham pasty and the afternoon cakes are like mini rocks - totally inedible. Reps useless - never saw them. On site shop poor choice. We were lucky in the fact that we only booked this as a last minute holiday and therefore it was cheap if we had paid full price I would have been really annoyed. If you can book this as a last minute holiday, get it cheap and don't plan on eating or drinking in the hotel, and instead just use it as a base somewhere to sleep this is ideal. Don't get me wrong I don't mind Germans but it really gets on your nerves when they get 5* treatment and the Brits get just 1*. Our room was clean on arrival on 30-8-04, however we were not given clean bed linen until 2-9-04. We did see the cleaner prior to this who simply entered our room and emptied the waste bin. The food was ample , but always cold. The hotel staff were not very forthcoming. The entertainment was very poor. On our departure we were accused of stealing a towel and our room key. When we denied this we were summoned to reception by a very rude and arrogant barman. On arrival at reception we explained we had given the key to the maid and the towel was mopping up rainfall which had flooded the room the day before , which i hasten to add we never even bothered them with. We then had our all inclusive wristbands cut off our wrists and subsequently were left to buy our own refreshments for the next two hours until our departure. I would not visit this hotel again for free. We stayed at Beis Beach hotel for one week in September and would recommend it. 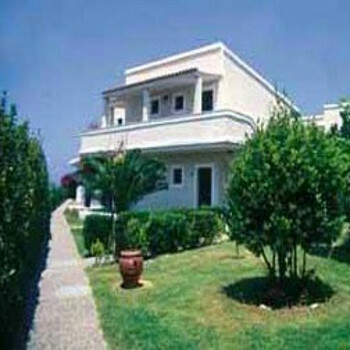 The hotel was very clean and the grounds well kept, our room was also cleaned on a daily basis. The location of the hotel is fantastic, right on a sandy beach, with two main pools in the grounds of the hotel and two childrens paddling pools. We stayed All Inclusive and enjoyed three meals a day, there was a large variety of hot and cold foods, which was always very good. There were snacks any time at the pool bars and drinks were free flowing and of good quality. The only downside of this hotel is the entertainment programme which is diabolical and only aimed at the German market! We found hotel staff always friendly and hospitable. I would definitely recommend this hotel to families and couples looking for a more relaxing resort. I can't fault the Hotel for cleanliness. In fact it was the best presented hotel we've stayed in out of 4 trips to Corfu. The food wasn't too bad although not much variety. And the location was excellent being right on the beach. Having said all that there's no way I would go back there if you paid me! Most of the hotel staff were very rude, miserable and extremley unhelpfull,including the Manager who spent all day walking round barking orders at them, basically running it like an army camp, which is what the place felt like. You weren't allowed to splash in the pool and you had to pay for sun-beds round the pool. To top it all off as we were boarding the coach to leave the Manager approached us, I thought he'd finally cracked and was going to see if we'd had a nice time and wish us a good trip home. But to my horror he accused me of stealing towels from the hotel room, which I've never done in my life. Can you imagine my embarrassment in front of everyone. To sum up, if you like to enjoy yourself on holiday and have some fun this won't be for you.